Imagine one marshmallow, 100 pieces of dried spaghetti, and a roll of masking tape lying on a large table. Next to the supplies are directions that read: “Elevate the marshmallow as high as possible using only the spaghetti and masking tape.” What was the first question that popped into your head? My assumption is your response had a disposition towards either “how can I do this?” or “why should I do this?” More precisely, your response probably could be whittled down to either a “how” or a “why.” If your first instinct was to ask yourself “how”, maybe an argument could be made that you are a natural problem solver, and that you welcome and genuinely are intrigued by challenges. If you asked “why”, then maybe you are someone who needs some good ‘ole fashioned incentive or a good extrinsic motive to perform well. Now imagine you were competing against three other people and the prize for the highest marshmallow was $100,000. Would the money motivate you to create a better structure, or would your relentless ambition towards excellence have been enough incentive for you to have placed your best foot forward from the outset? Undoubtedly, the money will make you think twice about your initial design ensuring your best effort, but my wish is to see more people performing at higher levels, not only due to monetary incentive, but also out of the sake of doing your best. As humans, we are all naturally great problem solvers when compared, to say, any other known form of life on our planet. That is not to say, however, all humans choose to exercise those talents. Nonetheless, people do possess the ability to solve extremely complex problems, and I often wonder what makes some individuals face challenges head on with great heroism, while others whimper away with not as much as a grain of genuine interest or desire. I believe the reasons for different responses are connected with the way we individually have been taught to approach problems, and the amount of respect we have learned to award such methods. The attitude individuals possess when faced with a challenge can be shaped with encouragement from teachers and parents alike. When given an opportunity to educate students (of any age) regarding their attitude when faced with a problem, in that moment, we must teach absolute fearlessness. Attack the problem and take no prisoners, metaphorically speaking. Unfortunately, the prevailing attitude from the many students I work with daily is one of apathy and a play-it-safe approach with very little risk of making mistakes. For many students, forfeiting has greater power in protecting one’s reputation with peers and themselves than a courageous attempt that could end, in what they believe to be, an embarrassing mistake. I am always looking to instill a sense of honor, embracing a philosophy that a whole-hearted attempt merits infinitely more respect than a forfeit, and not to plan to fail, but prepare to stay the course in the case of an unfortunate event. My advice? Treat a failure like a fart; understand it’s sure to happen, try to find the humor in it, and keep moving forward. Mistakes can often indicate progress because if you are not making mistakes, per Albert Einstein, you must not be trying something new, consequently, you are not learning. What, exactly, are we looking for? How do we see the graphene that we have grown? Starting on the left, the first peak is called the D band located at , corresponding to defects in the graphene film. Defects increase when the individual hexagons in the honeycomb structure of graphene are not all the same size and/or perfect hexagons. Greater number of defects in the honeycomb structure results in a taller D band peak. The next peak is the G band located at and the third peak is the 2D band found at . Monolayer graphene will have a intensity ratio of . 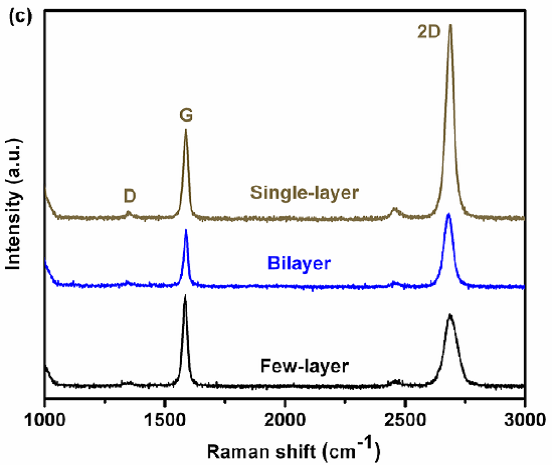 In general, the Raman spectrum of a nice monolayer sheet of graphene will show a very small D band with a 2D band approximately 2.5 times as tall as the G band. Notice in Diagram 1, as layers of graphene are stacked creating bilayer and few-layer, the intensity ratio decreases. When that ratio is less than one, we know the sample is at least two-layer graphene. 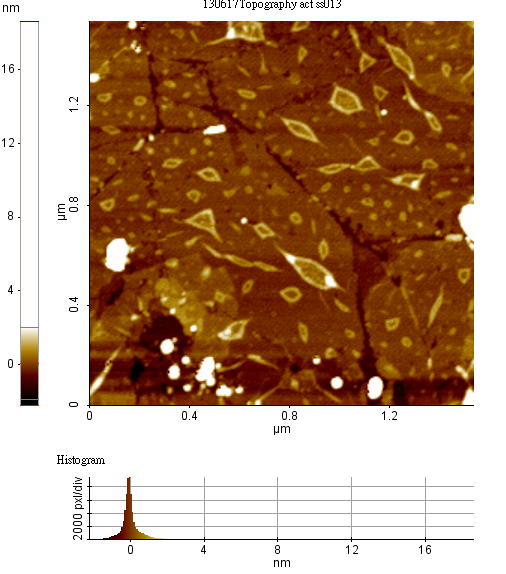 Atomic Force Microscopy (AFM) is an imaging technique employed when greater detail is desired for our as-grown graphene sample. AFM has atomic resolution capabilities, which means we could see individual atoms if so desired. However, our purposes for graphene do not necessitate such detail at this point. For now, we are using AFM to locate specific features in the graphene called grain boundaries (GBs). Graphene begins to grow on the substrate in various different locations as small points. Those many small points (called nucleation sites) grow and eventually run into each other. The areas where the growing islands of graphene bump into each other are called grain boundaries. Grain boundaries are now very well-known to degrade material performance. In particular, GBs will decrease electron mobility of graphene, which is undesirable. Therefore, there is huge motivation to discover a strategy to grow large grain sized graphene with little to no GBs so as to maximize electron mobility and material performance (more GBs may be better for your iPod, but not for graphene). The difficulty lies in the fact that GBs are very difficult to observe. We must first expose the GBs before we can see them. 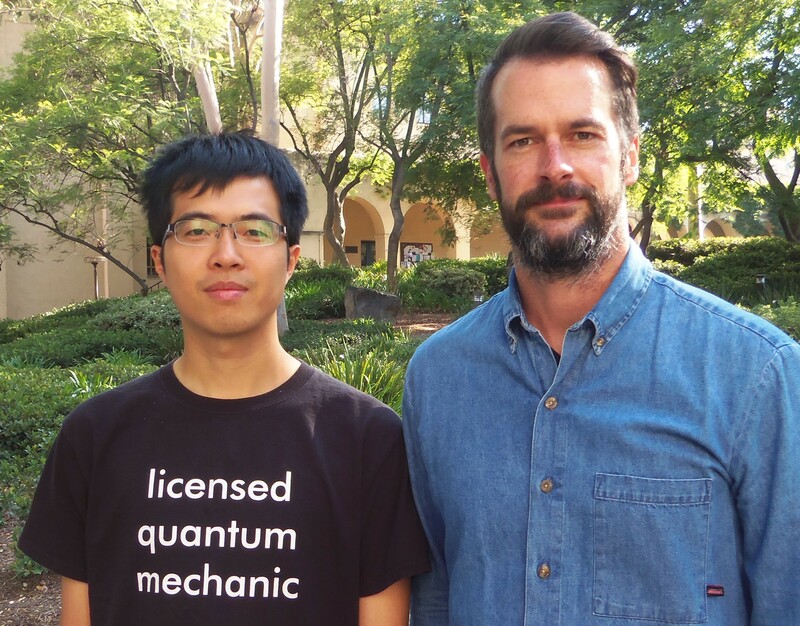 Exposing the GBs of graphene is not too daunting a task since years of research has documented the results of heating graphite (multi-layer graphene) in an oxygen containing atmosphere below 875 ˚C, causing oxidation to occur only at defect sites such as GBs. The as-grown graphene is transferred from the copper substrate to mica (mica is atomically flat and of high crystalline structure) and then placed in the furnace exposing the GBs. The transfer process from copper to mica is conducted by first spin coating the graphene side of the copper substrate with polymethyl methacrylate (PMMA) to protect the graphene for the second step, where the sample is bathed in an etchant (liquid solvent) to remove the copper substrate (termed wet-etching). 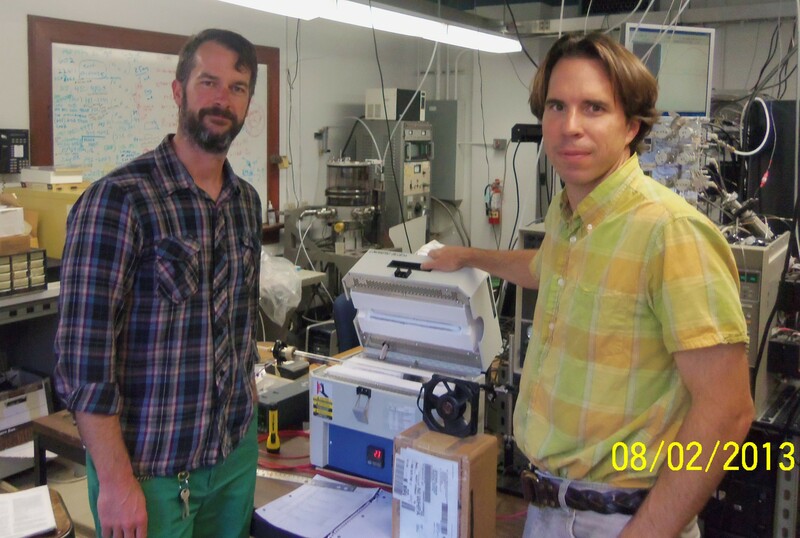 AFM is then used to image the GBs. AFM allows an image to be observed three-dimensionally by “feeling” the sample with a sharp point attached to a cantilever that is run back and forth across the face of the sample repeatedly. The cantilever allows the sharp point to travel up and down (in the z-direction) following the contours (i.e., hills and valleys) of the sample and in this way it “feels” the sample providing the information necessary for three-dimensional imaging. Image 1 shows an AFM image of graphene grown here at Caltech. The dark lines or cracks are the GBs that have been exposed using the method described in this article. The misshaped light-colored debris sprinkled on top of the sample is PMMA residue. The PMMA coating protecting the graphene during copper etching is removed with acetone. However, completely removing the PMMA coating is very difficult, usually resulting in a sample of graphene littered with specks of PMMA evident in Image 1. If you have read this far without skipping over too much of the science jabber or leap frogging through the sentimental ideology, you’re probably wondering why these two topics are showing up in the same article and why the writer hasn’t done a better job connecting the two. It’s likely due to a lack of any real writing skill, and an inability to make the connection than it does with any truth that they are unrelated. They are related and here’s how; if it weren’t for the tenacity, confidence, ingenuity, and more appropriately a commitment to doing their very best, scientists in universities throughout the country would halt all research in discovering better technique for growing graphene. Obviously, the incentive for perfecting a strategy for large-scale, large grain graphene growth isn’t only about doing their very best. Various technologies have made incredible sums of money for an incredible number of people, and with graphene’s promise to revolutionize technology on so many different fronts (transistors, solar cells, touch screens, etc.) you better believe research behind graphene is compelled by all shapes and sizes of incentive. However, like with most anything, the hardworking dedicated people willing to face a challenge head on, heroically, will reap the benefits… certainly. This entry was posted in Real science by benphysics. Bookmark the permalink. Interesting post – and nicely written for the lay reader. Of course, as a retired IT guy I have to object to the conflicting ‘GB’ acronym… I also wondered how you could resist using the phonograph analogy for AFM before realizing that you may not be familiar with that technology! Also, can the marshmallow tower be constructed in a protected environment? I have farther questions about grephene reasearch, how could I contact Benjamain Fackrell? you should put proper references for this blog.